Scientists at the College of Engineering and the College of Earth, Oceanic, and Atmospheric Sciences are developing a cutting-edge ocean lander, an autonomous vehicle that will descend to the sea floor to collect valuable geophysical data. Roberto Albertani, professor in the School of Mechanical, Industrial, and Manufacturing Engineering, is spearheading an important part of the lander: the shield, which will protect the vehicle, provide stability, and ensure proper buoyancy as it dives up to 4,000 meters to the ocean floor. The vehicle itself was developed by Adam Schultz, a professor of geophysics in the College of Earth, Oceanic, and Atmospheric Sciences. Measuring roughly 1.8 meters in diameter at the base and 1 meter in height, the lander will record seismic activity and magnetic and electrical fields on the ocean floor. Schultz will use these geophysical imaging methods to assess important features of the Earth’s interior. “The vehicle has a very distinctive array of instrumentation that, according to Adam, is unique in the world,” explained Albertani. It didn’t take much convincing to get Albertani involved in the project about a year ago, and he’s been volunteering his time ever since. His research and industry background in structural composites-based manufacturing and design, coupled with his keen interest in the ocean, make this project a perfect fit for him. 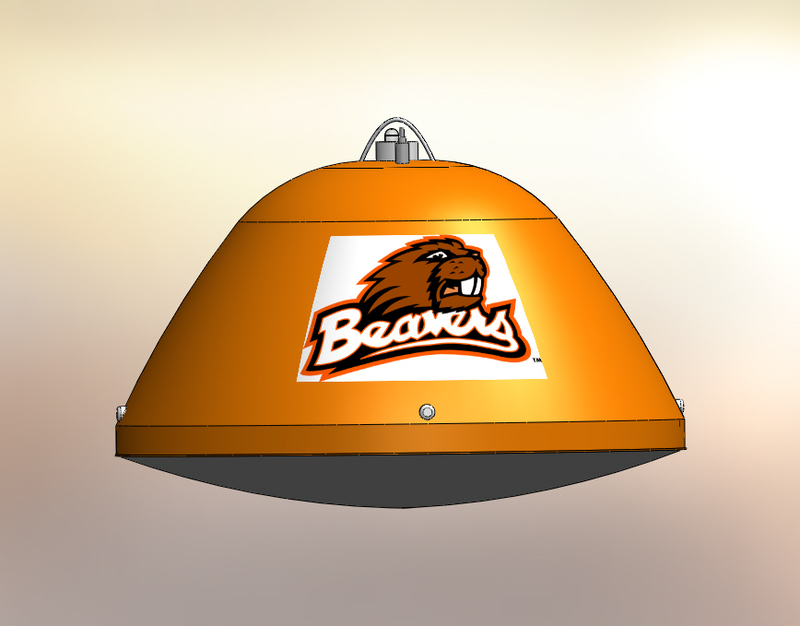 Together with Schultz and a team of students, Albertani designed the ocean lander shield with some unique features. A concrete slab at the base helps to drive the vehicle to the sea floor, but once it hits bottom, it is released and will eventually dissolve. Also, the body of the lander is constructed using numerous plies of multi-directional fiberglass that is vacuum injected with an epoxy resin, which creates a durable, corrosion-free, and continuous shield that protects the vehicle from trawling nets. “The beauty of composites is you can do any shape and have a very sturdy, stiff structure with the least possible mass or weight,” he said. Finally, Albertani designed a way for the vehicle to resurface by filling the shield with syntactic foam. “It provides buoyancy, but can withstand tremendous pressure,” he said. The shield will be built by a company in Scappoose, and Schultz and Albertani expect the vehicle to be ready in August or September 2012. When finished, the lander will don an unmistakable Beaver-orange exterior.